The world is full of mysteries, but is this one of them? According to a recently uploaded video on Apex TV’s YouTube Channel, a man has managed to travel back and forth in time, and even claims to have evidence to make a case. The man claims he was part of a top-secret program to send people into the future. 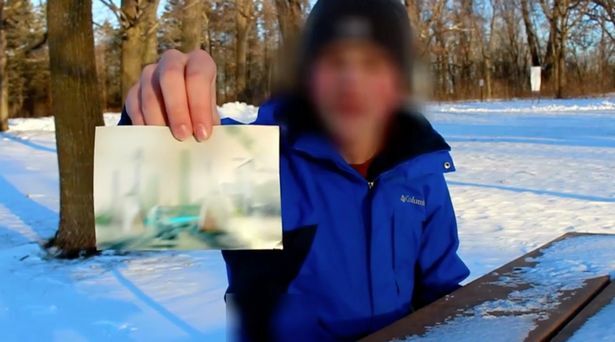 The YouTube channel ApexTV is dedicated to broadcast cases of paranormal activity, but never did they imagine that an alleged time traveler would one day approach them and show them an alleged photograph that he said, took in the year 6000. As noted in the video, ApexTV’s reporters met with the man who claims to have been in the year 6,000 at an undisclosed location. In the video, the face of the alleged time traveler is blurred, and his voice is altered. The man claims to have traveled back and forth in time using a top-secret program; he doesn’t specify which one. However, during the interview, the alleged time traveler showed reporters an alleged image which he says he took in the year 6,000. “They don’t want me telling you this,” says the man. “They’re especially not going to like what I’m about to show you. When I was in the year 6,000, I managed to take a photograph of a major city. However, the image, says the time traveler, appears extremely blurred since photographs “tend to distort” during time travel. The man in the video claims that the future is unlike anything we are even able to imagine today and that there are great scientific, political and medical advancements making the 21st century look nothing more than a primitive time. He also claims that society in the year 6,000 lives under the guidance of a supreme head of artificial intelligence. The video has already been viewed more than 3.8 million times, and many users rightfully comment that the alleged time traveler is nothing more than a hoax. While the story does sound interesting ( I mean who wouldn’t want to travel in time), it is not the first time someone has allegedly come forth claiming to be a time traveler. However, this man is the first to show alleged evidence of his ability to travel in time. The image itself is in terrible shape and doesn’t’ help the alleged time traveler as he tries to convince viewers he actually made the impossible work. The ability to travel in time has been a widely debated topic in the scientific community. Many scientists like Professor Stephen Hawking claim it is possible—at least mathematically and theoretically—to travel in time. Professor Hawking has recently proposed three ways by which time travel could be achieved. The first option is traveling through a wormhole. If we were to find a way to enter a Wormhole, we could then create a tunnel between two points in space-time, hence allowing us to travel in time. The second option says Professor Hawking, would only allow us to travel to the future. In order to achieve this, the traveler would have to get really close to a black hole, which would have the means to dramatically slow down time. After the tie traveler returned to Earth, time would have passed by normally. Finally, the British scientist says that the most viable alternative to building a time machine would be to build a machine that allows the traveler to move around our planet at the speed of light, which would allow the life of its passengers on board to pass 7 thousand times faster than on Earth, allowing a shift to the future. I assume that the man from the video hasn’t managed to make work any of the three above mentioned methods, which leaves us to ask, how the heck did he manage to do it, and if images get deteriorated during the time travel process, why did he not record a video?